A new energy system without a connection to the gas mains has been installed in approximately 230 houses in the Hoog Dalem district in Gorinchem, the Netherlands. The all-electric district is the only one in the Netherlands where houses are heated in winter with heat obtained from nearby ditches in summer. Little was known about the ecological impact of the associated ‘cold-water releases’. We therefore conducted a study, from late 2012 to late 2017, looking at the effects of this new energy system on the ecology, water quality, water plants and algae. Now all the data and measurements have been analysed, we can conclude that there is no evidence of negative effects on the water quality and ecology of the ditches. The homes in Hoog Dalem are connected to a collective well system in combination with individual heat pumps. Water enters the houses at a temperature of 12 to 13 degrees centigrade. It is heated to approximately 30 degrees by the heat pump before going into the underfloor heating system. The heat pump can also heat water to 60 degrees for tap water (to prevent legionella) and store this water in a buffer tank. Because demand for hot water during the year is higher than demand for water from the cold well, a way was needed to replenish the hot water wells in order to remedy any subsurface imbalance in the soil (this is a permit requirement). Some of the heat needed for this purpose is obtained by cooling down homes in the summer. The rest comes from the ditches around the area. The heat taken from that water is stored in the heat wells for use in winter. The cooled water is discharged into the ditch again. The principle of thermal energy from surface water in the watercourses in Hoog-Dalem. 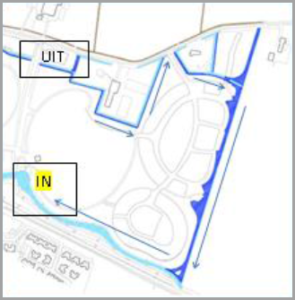 At UIT, cooled water is discharged in the direction of the arrows; it is taken in at IN. The distance between the discharge and inlet points is 1650 m. In this circuit, the water warms up again to the natural temperature. 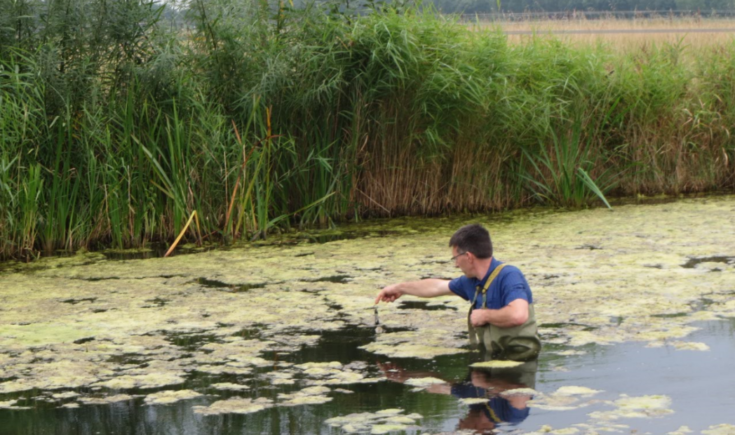 In a five-year monitoring programme, Deltares worked with the Rivierenland water authority and Bureau Waardenburg to assess the ecological impact of the release of cold water into the ditches. The temperature of the water is 5°C lower than it would be in natural conditions. Measurements from 2012, when the system was not in place, were compared with the years when the system was in operation. Variations in temperature, both in space and time, were continuously measured and also displayed in a 3D simulation model. The physical-chemical water quality (nitrogen and phosphorus) and biological water quality (algae, aquatic plants and fish) were also monitored at various locations. The release of cooled surface water had no demonstrable negative effects on the ecology or water quality in the Hoog Dalem ditches. The changes found were within the range of natural variations in water temperature and water quality. Nor was any effect found on water plants or macrofauna. To establish an accurate national picture of the effects of releasing cold water, we advocate more research. That will be needed to establish greater confidence in, and more familiarity with, this new source of energy. For example, the releases of cold water can also have positive effects such as the lowering of the maximum water temperature, which can reduce the probability of cyanobacterial bloom (blue-green algae). In addition, there is currently no safe lower limit for lowering the water temperature (in the case of Hoog Dalem, this is now -5°C). Nor is it known whether cold-water releases are also safe if cooling takes place earlier in the spring (and before June, as was the case here) or when more cooling is more intensive during the summer than at present.